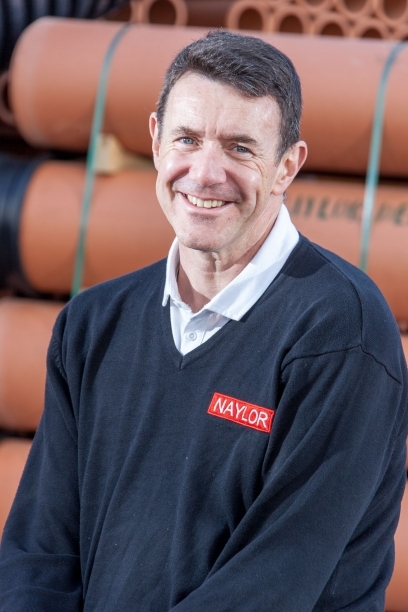 From a loss-making company with one product in a declining industry to a growing £50 million international business, Naylor Industries has been utterly transformed by strong leadership and a combination of niche specialism and product diversification. It could have been a very different story. 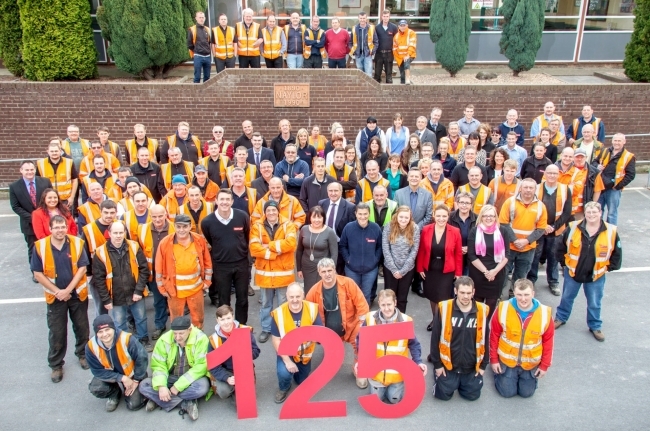 Naylor Industries is a profitable, privately-owned 125-year old group of six businesses making a range of mainly construction products, with export markets, business and employment awards and good growth. 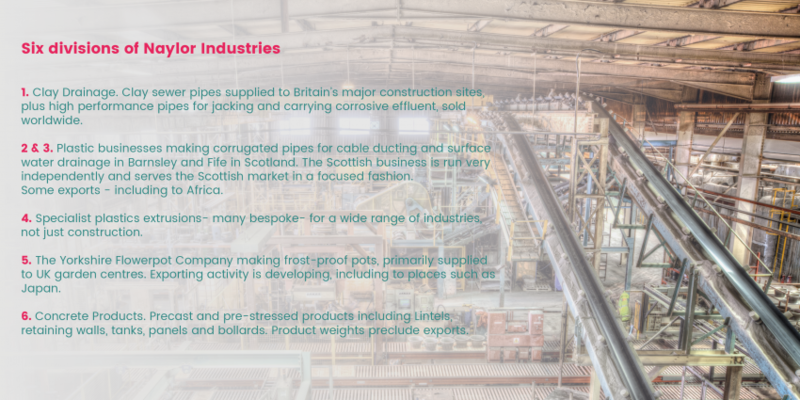 Rewind to the early 1990s and it was a loss-making £12m business with one product – clay pipes – in a recessionary UK construction industry. When boss at the time Allan Naylor died in 1993, son and current CEO Edward Naylor returned from his career in the City to help out. “The company’s bank debt was secured on the family home, and my mother’s house was at risk. I took a sabbatical and rolled my sleeves up,” he says in the characteristically pragmatic tone of a businessman who has dealt with the rough and the smooth. The problem was exposure to one market with one traditional product- clay drainage. Clay had historically dominated the sewer market but was under attack by alternative materials. It was clear that Naylor needed new products- and here was (then) 100-years of expertise in pipe manufacturing. Fast forward to today: Naylor’s group turnover is £50m, and clay has gone from being 90 per cent of the business to under 20 per cent. “We have held our market position in clay but have gone from being balanced on one leg to developing both new markets and new products”, says Edward. Today for a big company it has a flat management structure, with a 19-strong head office team including three main board directors, one PA and a central service team of 15, including the entire credit control and accounts system. Having seen alternative structures up close in the corporate world, Edward is clear what he doesn’t want: “I don’t want a very centrist organisation with lots of corporate suits where people are recharged to head office, often unnecessarily, with all the bureaucracy that comes with that. People lose their hunger,”. Naylor has six divisional managing directors who are encouraged to be entrepreneurs and run their companies with considerable autonomy. Monthly board meetings pull together the three executive board members, a non-exec Chairman and the six divisional MDs. Central service functions give periodic presentations, which gives them a level of accountability to the divisional MDs to whom their costs are charged. 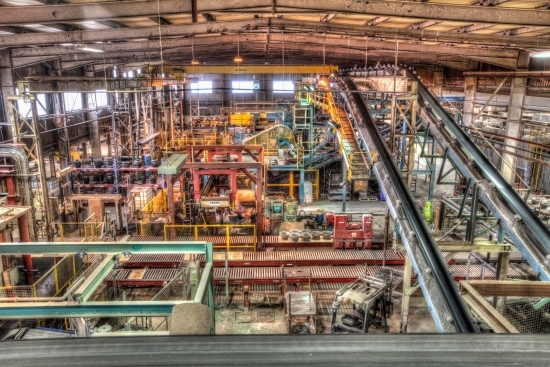 The weakest performing division presents first, “so there is a little bit of banter as the meetings approach about who’s on the spot, but the purpose is healthy and we exchange information in a very collaborative way.” Naylor collates and publishes monthly OEE data, to see how plant utilisation, efficiency and scrap rates compare and the chief operating officer, Bridie Warner-Adsetts, ensures best practice is shared between the six sites. Mega-cities in the southern hemisphere often have limited sewerage infrastructure and rapid population growth, producing a need to upgrade and increase capacity. And if you are the planning board of a city like Jakarta or Manila with congested roads, digging up the city streets to lay drainage is not a sensible option. 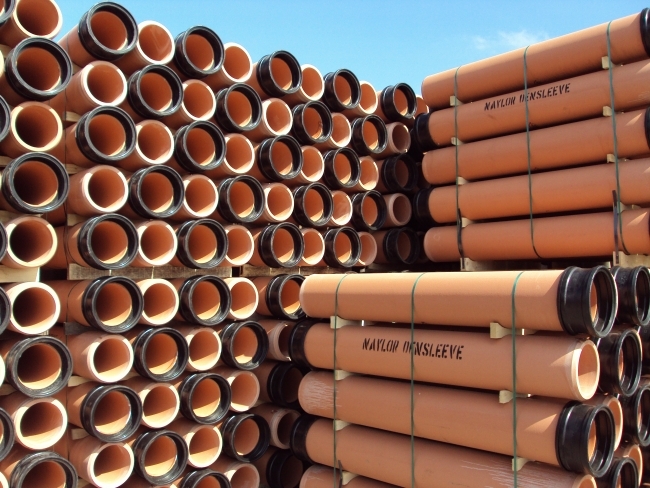 Enter Naylor’s high-performance pipes for pipe jacking. These are super-strong pipes that are hydraulically pushed through the ground without digging up the highways. “There are hundreds of pipe makers between here and Asia but we make the super strong pipe that you can push under the road without it cracking into pieces,” says Edward. Naylor reached an inflexion point in 2013/2014 where parts of the business “were beginning to creak” under the growth; in particular, a number of its businesses were facing physical space constraints. Over a 2 year period, Naylor relocated its head office and its Wath bespoke extrusions business to a new freehold site at Wombwell and moved its Concrete products business from a 3-acre leasehold site at Ossett to a 9-acre freehold site near Barnsley. “The story of the last two years was about moving space-constrained production to bigger sites,” Edward says. “You can take a 20, 30, 40 year view as a privately-owned business. If we had a share price to maintain, we might have been tempted to “make do and mend” rather than suffering the cost and disruption of moving”. The additional space has facilitated the purchase of new capital equipment as well as the acquisition of Whites Concrete, a complementary precast concrete business. Naylor has a business plan to double the size of the existing businesses and reach £100 million sales. “Whether we achieve this in five or 10-years remains to be seen”, says Edward. But its devolved and light touch management style and its focus on developing niche, specialist products on the back of volume manufacturing has served it well. This British Mittelstand company, which last year won a coveted Investors in People Gold award, is well placed with a smart strategy to hit its target.